Every time we plan on taking a minor break from the blog we caution ourselves not to let it become an extended intermission. And yet it did. Again. Must try harder next time. Anyway, we’re back again after another long hot summer. Now, in the first week of November, we’re wondering just when autumn might turn up as right now things are unseasonably warm. Nights are drawing in and the early mornings are cool but by mid-morning it’s hot enough to be sitting outside with a cup of coffee in just shorts and t-shirts. 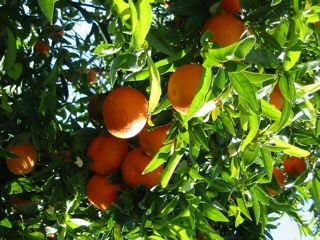 The bougainvillea continues to put on a show, the pomegranates are ripening to perfection and the first of the mandarins are just starting to turn from their invisible green to their showy winter orange colour. Returning to the summer, and our extended absence, it is safe to say that things haven’t gone quite to plan of late. I could talk about learning experiences and the importance of chewing one’s food or I could just find a handy photo. 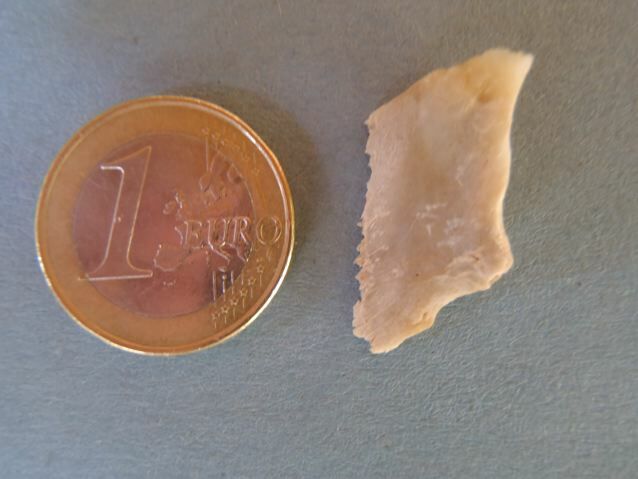 That, a piece of lamb bone, was embedded in Ian’s throat for a couple of weeks. Unhelpfully it was several inches below his Adam’s apple meaning surgery was needed. Apparently the oesophagus has three concentric layers and the razor-sharp bone had punctured two of the three. One more and things would have been terminal. It is said that there isn’t enough time to make all the mistakes in the world yourself so you should learn from others. So, chew your kleftico well people, the consequences can be serious if you don’t. As if that weren’t drama enough the surgeons spotted another problem on the pre-op scans. “Did you know?” They asked. “No, no we did not. When shall we schedule the next round of surgery?” A more serious procedure from which he is still recovering. In more cheerful news we snuck in a week in glorious Italy recently. Booked before the medical dramas, and technically inadvisable, we spent wonderful days pottering around the fantastic city of Bologna followed by some time in Venice staying at the superb Bauer Palladio. With a lucky piece of accidental timing we managed to be in Venice during the brief dry spell between two major floods. Much of this, as well as worrying wildfires, naughty kittens and other random ramblings, can be found on our Twitter feed here. ’tis snowing at the top of the island. Anyone fancy a day skiing on Troodos? 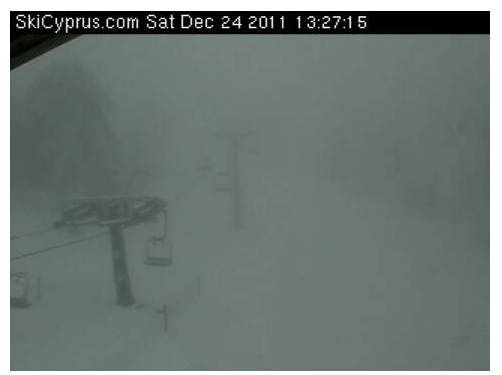 The webcam on Troodos, found here on SkiCyprus.com, had this image yesterday afternoon. It feels clichéd to comment on Americans knowledge of world geography but sometimes, just sometimes, a tale must be retold. A year or so ago we were on a holiday, a vacation, where a goodly proportion of our fellow travelers were from the US. Early in the trip we fell into conversation with another couple who happened to be from the States. They were lovely: well read and well-travelled, interested in their surroundings and their traveling companions. They heard us chatting about our plans for the day and quickly struck up a conversation. Lovely accents, they said. Were we from Australia? It wasn’t the first time we’ve been asked so we smiled and said no. English, but not living in England we said. We live in Cyprus, in the south-eastern corner of the Mediterranean. That bit about the south-east corner of the Med is important, we’ve found it heads off other confusing conversations. Not any of the north American cities called Cyprus in north America. Not the Cyprus off the coast of Italy (no, there isn’t one). Just the island of Cyprus snuggled down in the corner of the Med. Occasionally we mention that we’re only 70 miles from Syria but not often, it depends on the person. Anyway, having established that it was the country of Cyprus our fellow travelers looked excited. What an amazing co-incidence, they said. Someone they knew, a family member, was in the process of buying a newly built property in Cyprus right now. Perhaps we knew the development? Or the developers? Sadly we didn’t recognise the name of either. When they mentioned the price of the property, a seven figure sum, that wasn’t so surprising. Not so many properties like that round our way. But we were curious: roughly where was the property? They hummed and hawed and consulted each other but weren’t entirely sure. On the eastern coast they thought, perhaps along a big peninsular or promontory. They thought the nearest airport began with an E or an H. Our hearts fell and we exchanged concerned glances; the only place in eastern Cyprus that fits that category is the Karpaz peninsular, known colloquially as the panhandle. It is in the North, the area occupied by Turkey since 1974. Buying property there is fraught with difficulty, even for those who understand the issues and the pitfalls. There are some people, many of them English we’re sorry to say, who have made fortunes by selling land that isn’t theirs to sell. When the events of ’74 took place many, many people were forced to abandon their homes. Almost 40 years later they haven’t been able to return and some people have taken the opportunity to sell the houses or the land on which they stand or the olive or citrus groves that they owned to developers. It is possible to buy land in the North at a 30% discount to that in the south, but to do so is risky at best. There have been well documented cases of people buying land only for the original owners to come along later and demand their property back. Carefully we explored just how much of this they knew. Not an awful lot it turned out. They had a vague recollection that the history of the island was troubled but not that it was still divided or that there was an ongoing UN peace-keeping force. They knew nothing of challenges of buying property in the disputed north but were quick to understand that the transaction that their relative was considering might be at risk. We suggested some research that they might want to do once they were back at home and we gave them details of a lawyer who had a reputation for being honest, unbiased and experienced in difficult property transactions. They took copious notes and thanked us for our concern and the information we’d provided. As we left to start our day of exploring they were deep in discussion and both looking troubled. Throughout the day we returned to the subject. Imagine being on the cusp of buying an expensive property thousands of miles from home and finding out that the whole thing might be at risk! That evening they spotted us as we were heading to dinner. They rushed over to speak to us but with large smiles on their faces in place of the looks of concern when we had parted earlier. We spoke with our relative, they said, and it’s going to be ok! Well, how can you be so sure, we asked. Well it turns out that the villa is in Crete, not Cyprus, they said. One of the advantages of living here and no longer working is that we are free to travel as and when we wish. One of the disadvantages of our life here is that our travel budget is nowhere as large as it used to be. When we switched from that high-stress corporate lifestyle to a laid-back and mellower existence here in Cyprus we also gave up about 90% of our income. That said we do get away from time to time and have had some fantastic trips in the last few years including three transatlantic crossing on our old friend, Windstar’s Wind Surf. Instead of deciding what we would like to do or see and where we might go we keep our eyes peeled for offers and opportunities that might suit. Being able to travel at little notice or off-season or via an indirect route means that we may be able to take advantages of offers that others may not. As part of that we are signed up to receive emails from many of the major airlines as well as a number of travel companies. Including in that list of companies are a growing number of Flash Sale or Invitation Only travel groups. These have been growing in number and popularity in recent years and suit our circumstances well. The advantage is a well-priced deal, below list price; the disadvantage is that the sales aren’t open for long, typically seven days or less. For those who are able and willing to keep an eye open for deals, and decide and book quickly, there are bargains to be had. Later this year we have a few days planned in Athens; last year we spent a week cruising out of Venice and along the Dalmation coast. In both cases the final prices we paid were significantly below list or brochure price. It’s worth noting that in the cruise industry virtually no one pays brochure price, in almost all cases they are considered to be nothing more than a starting point for discounts. In the case of our trip last year that discount ended up being about 75%, not a figure to be sneezed at. (a) To sell distressed inventory – when occupancy rates are low, limited time sales on those sites will provide them with incremental revenue. (b) To access a premium base of customers – private sales sites tend to claim a high-end, quality member base. When we first started AradippouTales we detailed some of our road-trip as we drove from our home in London down to Venice then on to Athens and finally to Cyprus. Our last weekend in England was spent in a lovely hotel called Nutfield Priory and we blogged about it in one of our very early entries here. The reference to Brad Pitt was serious; on a previous visit to the hotel we bumped into him while he was in staying at the hotel and, accidentally, fell into conversation with him in the hotel library. He was polite and charming and perfectly happy to chat for a while. The hotel is part of the Hand Picked hotel group and offers for other hotels in the group appear on SecretEscapes, a UK flash sale site, from time to time. Whilst browsing through their current and upcoming offers we couldn’t help but notice that there’s a sale starting for Nutfield Priory later this week. Until the sale is live there’s no way of knowing how good the offer might be but at present there’s a deal running for Norton House, a sister hotel based up in Edinburgh. A quick comparison of the rates available on the flash sale versus the hotel’s own website suggest that there are discounts of between 20% – 30% to be had. 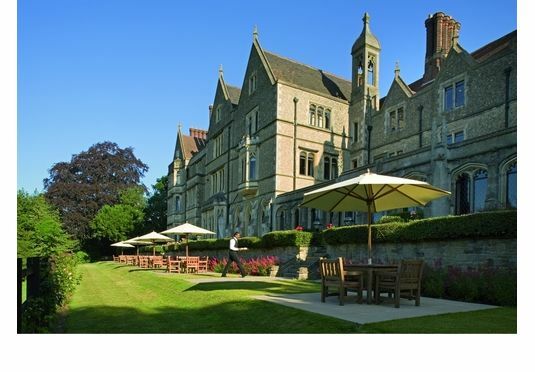 It’s reasonable to assume that the sale for Nutfield Priory will be comparable. Anyone wanting to take a peek at the deal, or sign up for future offers at SecretEscapes, can do so here. Now, back to trying to convince Ian that a couple of days at Evanson Ma’In Hot Springs in Jordan is a good idea right now. Jetsetter have a great deal on; what do you think my chances are? A while ago we posted a short video taken on board MSY Wind Surf in the middle of the Atlantic. Actually, not really the middle, we were about 300 miles from the Azores, but not that far off. We were part way through a 14 day Transatlantic crossing which started in Barbados and ended up in Lisbon. The footage was taken outside the Compass Rose bar late morning. How far away is the horizon? Umm, not sure. A few miles … or so … maybe more … or perhaps less? Thinking someone on the bridge should know the answer Ian wandered up there to ask. As luck would have it the Chief Engineer was present and happy to help. Such is the beauty of sailing with Windstar: have a question, well ask the Chief Engineer and he may just have half an hour spare. Anyway, the answer was this: With normal visibility the distance to the horizon, in nautical miles, is 2.1 times the square root of the height, in meters, above sea level. In that time we were about 12m above sea level so about 7¼ miles to the horizon. Taking the maths one step further, if the distance to the horizon was just over 7 nm then the circle of sea that was visible to us was about 165 nm² … and not another ship in sight. Actually, we hardly saw another ship the entire crossing. There has been an interesting discussion over at Cruise Critic regarding appropriate dress for those visiting European countries as part of a cruise. In particular: what should be worn for visiting churches and other religious establishments? Those on cruises are often up against airline baggage limits and need to balance light packing with the ability to dress for all occasions. Whilst shorts, tshirts and trainers are preferable for sight-seeing they are usually not appropriate if the sights include the inside of a church. Among travel regulars it is often said that for visiting churches one should have shoulders and knees covered. 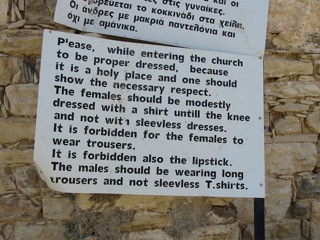 Here in Cyprus it is not unusual for Greek Orthodox churches to have a more stringent dress code. This is not to say that people would be turned away as many churches are not manned outside of regular services but entering a church in appropriate clothing could well give offense to local residents and churchgoers. The most strict dress code we’ve come across to date is in the Church of the Blessed Virgin Mary the Merciful in Kato Lefkara. 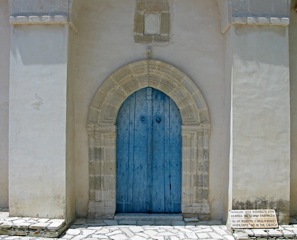 Outside the door of the church is a relatively standard request for visitors to dress modestly. However there is a lengthier instruction placed in the churchyard. Quite why lipstick is immodest isn’t clear. It begs the question: is lipgloss ok, or lipbalm? 30 years ago the Zenobia, a roll-on roll-off ferry, sank in Larnaca harbour; today she is considered to be one of the greatest wreck dive sites in the world. LucyInnovation has written a super piece on what it is like to dive in and around her. Enjoy!